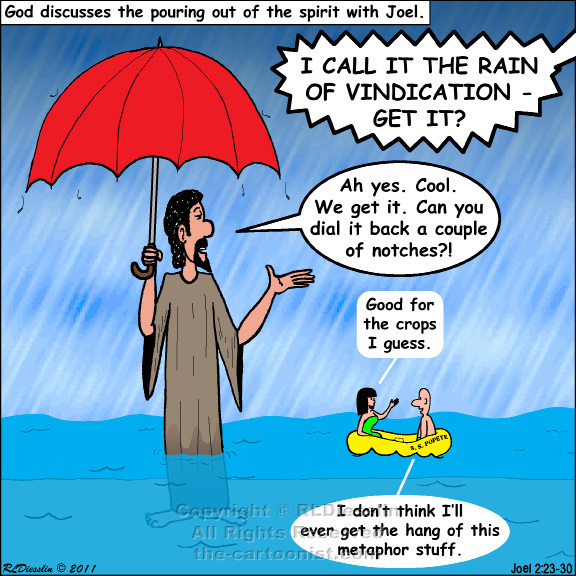 23 O children of Zion, be glad and rejoice in the LORD your God; for he has given the early rain for your vindication, he has poured down for you abundant rain, the early and the later rain, as before. 24 The threshing floors shall be full of grain, the vats shall overflow with wine and oil. 25 I will repay you for the years that the swarming locust has eaten, the hopper, the destroyer, and the cutter, my great army, which I sent against you. 26 You shall eat in plenty and be satisfied, and praise the name of the LORD your God, who has dealt wondrously with you. And my people shall never again be put to shame. 27 You shall know that I am in the midst of Israel, and that I, the LORD, am your God and there is no other. And my people shall never again be put to shame. 28 Then afterward I will pour out my spirit on all flesh; your sons and your daughters shall prophesy, your old men shall dream dreams, and your young men shall see visions. 29 Even on the male and female slaves, in those days, I will pour out my spirit. 30 I will show portents in the heavens and on the earth, blood and fire and columns of smoke. Joel is a prophet most likely in the 5th century BCE, probably in the early Hellenistic period (Greek rule) and Israel and Judah united again (under Greek control). There has just been a locust devastation that Joel views is punishment from God. The people repent and this passage picks up with God's response and promise for the future. Things are going to be very good and there will be a time of plenty and peace. Perhaps the most famous quote from Joel is verse 29 where the relationship with God will be so intimate that prophesy, dreams and visions of God's goodness will be widespread. Umbrella sales will be up.